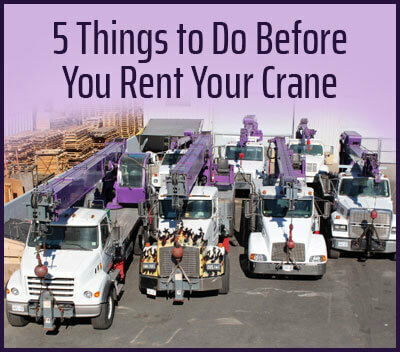 Call the mobile crane experts at Purple Crane for all your heavy- and light-duty lifting needs in Santa Ana. Since 1983, we've offered superior crane services at the most competitive prices. Our crane operators are all highly experienced and CCO-certified, and our fleet of modern cranes is available 24 hours a day to accomplish any lift. In our 30 years of business, we have lifted more than 75,000 objects for tens of thousands of satisfied clients. Call us today and experience first-hand why our past clients continue to choose and recommend Purple Crane. 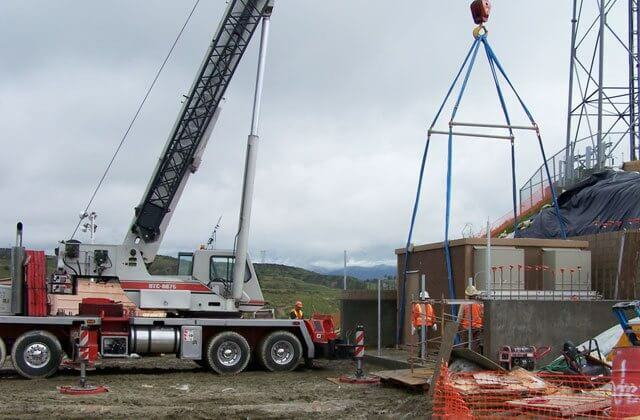 In addition to the above, our cranes can basically handle any lifting job, from 3 tons to 75 tons. These loads can be lifted as high as 163 feet with our largest crane. Our fleet includes hydraulic mobile cranes, heavy and light duty boom trucks, and high capacity trucks and trailers (up to 15,000 pounds), all readily available for jobs anywhere in Santa Ana. We also rent man baskets to fit one or two workers (up to 300 and 500 pounds, respectively). All of our equipment is routinely inspected and serviced. In addition to being known for renting state-of-the-art, well-maintained cranes at great rates to our Santa Ana clients, we also offer a team of crane experts who are highly trained and experienced. All of our employees have at least nine years of experience, but some have as many as 40! 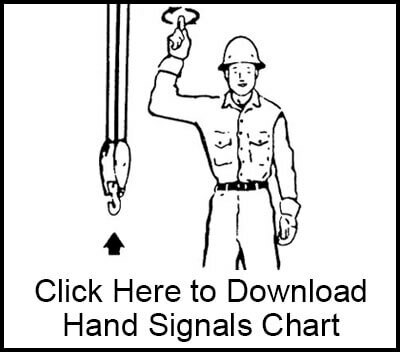 Their expertise allows them to correctly determine the perfect crane for every job. Call us now to learn more about our crane services. We can provide a crane rental and operator, anytime of day, anywhere in Santa Ana. Light duty cranes can be rented for as little as 2 hours, and heavy duty cranes for as little as 4 hours. We are standing by 24 hours a day, 7 days a week to take your call. 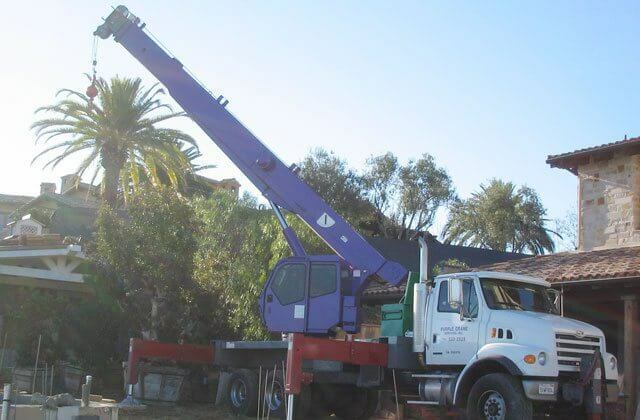 Purple Crane is the preferred choice when a crane is needed to lift or transport shipping containers in Santa Ana. We can use our heavy-duty cranes to lift one or a number of shipping containers, and have a truck and trailer to relocate them to any destination in Southern California. Our professionals will determine the best crane and/or trailer to move your crate, container or other storage unit when you call. 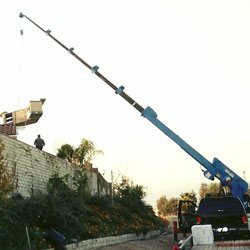 Selecting the right crane for your Santa Ana building project is a key factor in controlling your costs. 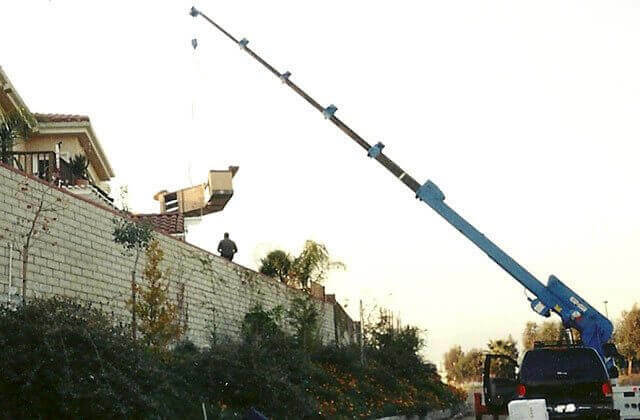 Getting a crane that is too big will result in overpaying for your lift, while a crane that is too small might hinder your ability to accomplish the lift safely, if at all. In order to ensure that you are getting the best crane for your needs, call our crane experts. We have cranes to move a building materials of every shape and size, such as roofing materials, cinder blocks, concrete, solar panels, beams, and lumber. Our all-terrain mobile cranes allow us to easily haul these materials from one location to another. We can move single items or entire pallets across your site. We can also handle all the haul-away or transport your materials to another location using one of our trucks and trailers. Purple Crane's dedicated team can help you lift, move and/or haul away concrete columns, wood beams, steel rebar, metal trusses, and more for construction jobs in Santa Ana. We have CCO-certified, highly experienced crane operators and a wide range of mobile cranes that can handle construction jobs of any size in Santa Ana. We move loads that weight up to 75 tons and can lift construction materials as high as 165 feet. We can also offload a truck or trailer; stack heavy items carefully together; or transport items to another worksite anywhere in Southern California, including to approved scrap-yards. We efficiently move machines and equipment of all sizes and shapes for construction and industrial projects in Santa Ana for very competitive rates. We can lift large appliances, medical equipment, printing presses, manufacturing machinery, and more. We can also transport your machines or equipment safely between Santa Ana and any other Southern California location. Call today to reserve one of our cranes. As a full-service, OSHA-compliant crane and operator company, Purple Crane frequently performs expert lifts for the utility industry. Our team is available 24/7 to drive and operate any one of our cranes or large trucks with trailers to assist in the transporting and lifting of emergency generators, light poles, utility vaults, streetlights, and more in Santa Ana. We also can provide man basket for one or two people. Purple Crane has assisted heating, ventilation and air conditioning (HVAC) companies in Santa Ana remove and install residential and commercial air conditioning and heating units since 1983. 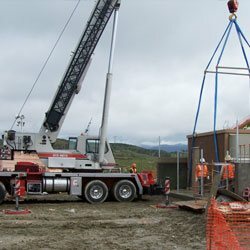 We are available to help with last minute requests, and in calculating the right crane for your project. If there is an old unit, we will remove it and offer free haul-away to an approved AC recycler. We have the expertise to accurately, safely and efficiently place the new unit in any space of your preference, whether it be in a side yard, backyard, or rooftop. We frequently work with landscapers in Santa Ana to assist in moving pine trees, palm trees, boulders, statues and fountains. We are available day and night to answer any questions, and can obtain an insurance certificate within a day, in order to ensure that we can respond to the needs of our clients as quickly as possible. Additionally, we rent man baskets for one or two workers to assist with tree trimming at almost any height (up to 12 stories). Need a Crane Company to Deliver Your New Spa or Hot Tub to Your Santa Ana, California Home? 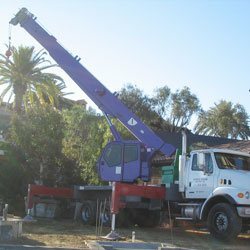 Purple Crane can work with contractors or homeowners in Santa Ana to facilitate the installation of any large item. We often deliver swim spas, hot tubs, Jacuzzis, spas, sculptures, gazebos, and barbecues. We'll lift your outdoor furniture, equipment, or other structure safely over gates, trees or homes, and place exactly where you specify. Call us today to discuss your lifting needs. Our superior crane services are always competitively priced. 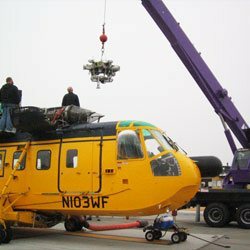 Contact Purple Crane whenever you need a crane in Santa Ana. 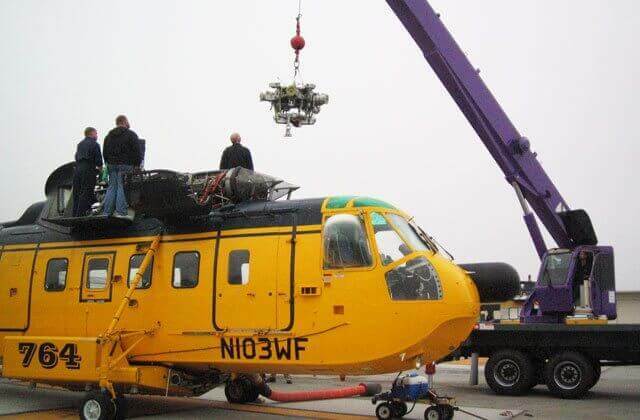 Our professionals will ensure that we select the best lifting equipment for your job. Credit cards, cash and checks are all accepted. We can also open credit accounts for those who qualify. Purple Crane is completely compliant with Federal OSHA regulations, and we stay on top of the crane industry's best practices by being a member of SC&RA (Specialized Carriers & Rigging Association). We are CCO-certified by the National Commission for the Certification of Crane Operators, and fully insured by NBIS, the leading insurance company dedicated to serving the specific needs of the construction and transport industry.